Man, that sure means you want to travel with a small party. I think I'd add the 5s back in, so there's room for some henchmen, etc. I also think I'd give them more spots to camp on. Because they also have to be adjacent to a spot that also matches the number they've rolled or lower? The way I'm understanding what you've written is: you can't move inwards (to a higher number), unless you've rolled that number. Ie: you're on a 4, you roll a 1, you have to move to either one of the two open fours (diagonally), one of the two next-door 3s, or the 2 further out (depending on occupancy). I'd like a method to help out people who're on verge of falling off. Like maybe taking a penalty on your next roll in order to pull them in closer, or add to their current roll. I dunno, have you tested this one out? My feel for the spatial / dice says (to me at least) that this would be trouble in a group larger than 3. Especially if you can't go inwards a ring, if you don't have that on the dice. Also, perhaps there are too few 2s available. Ie: you get on a 2, and both 3s are blocked (say 5 other party members and bad placement), then there's a 50% chance you get lost. If there were more 2s around the edge, then you'd only get lost 17% of the time if you got badly placed/had bad rolls. And you'd still have less than 67% chance that you could improve your position/placement. Hmm, looking at it again... if you're on a 2, can you bounce all along the outside 2 ring, in either direction? And, if you're on a 2, and the adjacent 2s are also filled with people doing bad rolls, then you'd need to get a 3 or higher in order to not be forced off your spot? Hey, thanks for the comments. Yeah, I actually got a chance to playtest this one with my buddy. It was fun but it took ~30 turns for anyone in a party of four to fall off. That's why I introduced the combat modifiers, otherwise I think it would be so safe as to be pointless. And we were just assuming default stats. If anyone in the party had an exceptional Int it could have doubled the time to slip off. It does pressure the party to stay small, but I like that-- no taking 20 hirelings into hell, kiddies, just a handful of heroes. If you wanted to make it easier for slightly bigger parties you could allow bonus to rolls for every + in an Int bonus for systems, like Moldvay, that get up to +3. You could also allow a single mod per yogi, psionicist and if you want to be really generous, any wizard. Oh yeah, definitely down with combat modifiers (and maybe psionics modifiers too?) I mean, if you're barely holding on, maybe you get possessed. But, I've still got those functional questions from above. Maybe some lines connecting boxes would straighten that out. 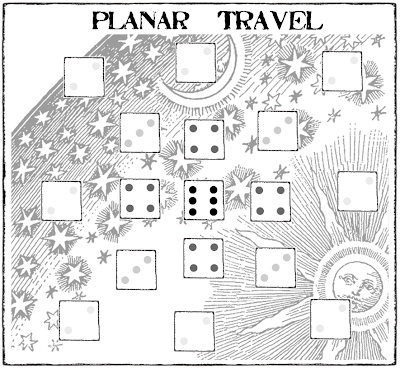 You can move anywhere as long as your die roll is high enough and the spot adjacent isn't occupied. Don't worry about the rings when moving, just when doling out combat modifiers. In your example, if you're on a four and roll a 1, you've got to slide to the lowest adjacent spot (because there are no ones) which is the two. Are the 2s adjacent to each other? Or, are they separated by the spacing? 'if you're on a 2, can you bounce all along the outside 2 ring, in either direction?' since my prior example: 'you get on a 2, and (if) both 3s are blocked ... then there's a 50% chance you get lost.' 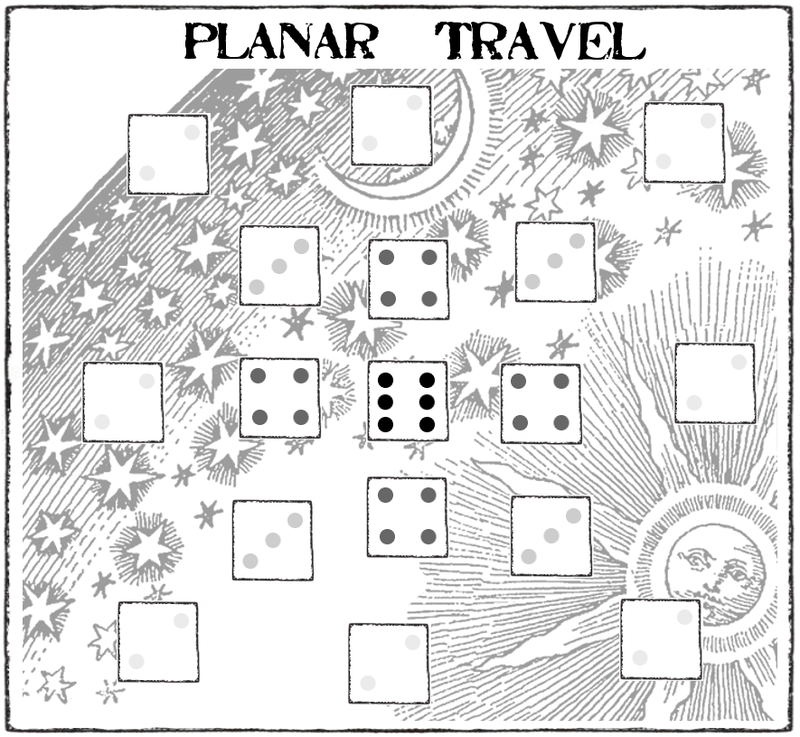 implies that they're not adjacent - which is how I first read the placement of the dice-spaces. Yeah, the spacing is just cosmetic. The way I imagined it, the two spots are adjacent. I'll make pics illustrating legal moves and put them in the Travel Challenge compilation when I add this in. Really original way of visualizing "astral" travel. Looking at it and thinking back to your request (in receding rules) for psionic and grappling. I'm imagining a similar grid delineating position/maneuver in a mental or physical duel. If you feel duel is mostly about setting up or jostling for advantage and the actual blows are secondary. Hmm, that's a good idea-- an abstract mind combat arena. One thing I've been worrying about for psionics is that it takes too long in comparison to normal combat. I'm working on a way for it to be fast enough to fit right in but still feel different and interesting.